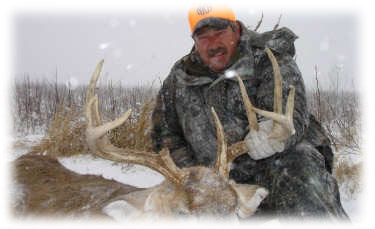 We are able to bring to you some of the Best Whitetail Trophy Deer Hunting that Kansas has to offer because of the genetics of the whitetail deer here in Kansas. The years of limited hunting, 19 years of outfitting experience, and the fact that we have planted many wild life food plots in key locations around the ranch to attract and to hold deer helps us give you a quality Kansas deer hunting experience. 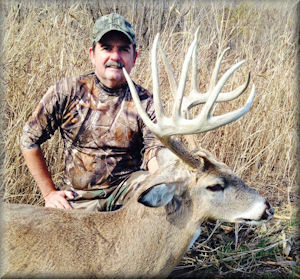 The Kansas blackpowder deer hunting season offers one of the first opportunities in the nation to harvest a trophy whitetail buck with the season opening during mid-September. This gives you the unique opportunity to hunt deer that have been undisturbed for nearly a year. The bucks are primarily interested in feeding this time of year and are somewhat patternable. Early morning and late afternoon deer hunts can be quite impressive. One of my blackpowder deer hunters summed it up pretty well. "Why go to Canada only to freeze your tail off and see	1 monster buck all week when you can come to Kansas in September and enjoy 70 degree weather and see 6 monsters	like I did!" Kansas regulations now allow scopes on muzzle loader guns. After years of searching for wounded animals due to hunters being forced to use open sites, It's About Time Kansas! 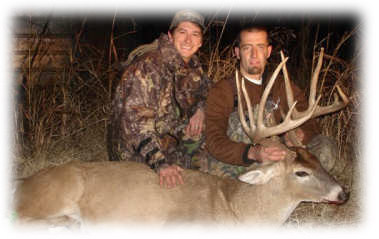 The Kansas archery deer hunting season opens October 1st and runs through December 31st. Not much compares to the first couple of weeks of November bow hunting in Kansas. With bucks chasing does from daylight to dark, and bucks charging in to challenge your rattling sequence, the magic time of the rut is unmatched. Bow hunting offers the chance to be in the middle of the action. While this time is something to be a part of, we have discovered that the early part of the deer hunting season can be quite productive also. While some deer hunting programs and videos seem to picture a 160 around every tree, this isn't the case. On average 75% of our hunters have an opportunity at a buck scoring form 130-160 and some getting shots at bucks that would truly fall into Trophy Status. Rifle deer hunting season brings the opportunity to reach out and harvest the buck that has kept out of bow range. The secondary rut occurs during this time frame, keeping bucks on the prowl. With the wide open terrain, the stand locations offer shots from 50 yards to long range, depending on the situation, proficiency with your weapon of choice is a must. 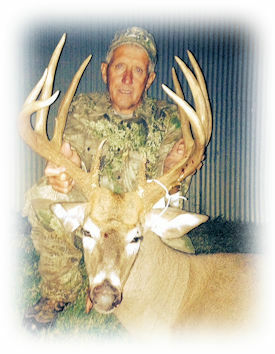 While rifle deer hunting in Kansas offers the chance to take most bucks you see off stand, it is still a challenge to come away with the buck of a lifetime. 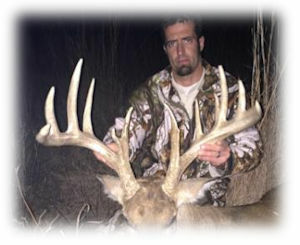 Kansas has a 12 day deer hunting season. Kansas is a draw state. The application period is the entire month of April. Call Kansas Dept. of Wildlife and Parks at 620-672-5911 or click on KDWPT.state.ks. Applications aren't available until the 1st of April. 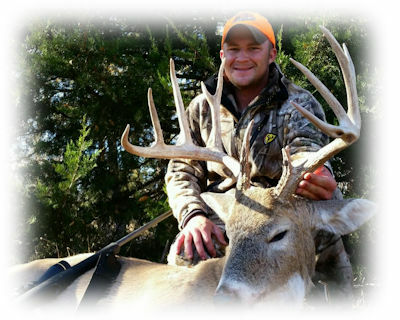 Kansas drastically increased the number of permits issued to "meet the needs of NR hunters". For the last 6 years 100% of my clients received permits in the draw, so obtaining a tag should be easily achieved. A hunters education card is required to be carried by all hunters born after July 1, 1957. Wichita Mid Continent Airport is located within an hour of KBB hunting properties. There are several affordable local lodging and restrauant options available, ask us when you call and we can get you pointed in the right direction. Kansas Deer Hunting visitors have visited this site! Come back and see us.